Today as I write this column it is the 199th anniversary of Oliver Hazard Perry’s Victory in the Battle of Lake Erie. This past historic weekend (September 8th and 9th) we celebrated along with the National Park Service, US Navy, US Coast Guard, Boy Scouts of America, the community of Put-in-Bay and all our friends who came from near and far the opening salvo to the 200th anniversary in 2013. Just a little over one hundred years ago, newspaper man Webster Huntington and engineer John Eisenmann and group of interested citizens began a success campaign to build a monument of national importance to honor Commodore Oliver Hazard Perry’s incredible accomplishments in the Battle of Lake Erie before the Centennial Year (1913) began. They formed a multi-state commission to raise the funds for building the monument we see today. In 1911 President Howard Taft signed a bill to conditionally fund the monument. Various designs were considered but on July 4th 1913 the cornerstone was laid, not just for a monument, but a truly fitting tribute to Oliver Hazard Perry and the men that collectively changed the course of our history and the enduring peace and friendship we have enjoyed since with Great Britain, Canada and the First Nation. In June of 1915 the International Peace Memorial was completed and opened to the pubic (thought it did not actually become a National Park Service site until July of 1936), providing a view to the battle site, and a call out for generations to come, reminding us why September 10th 1813 was a turning point in the War of 1812. 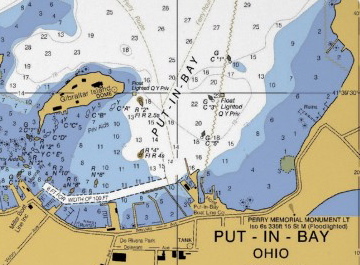 So Sunday morning (September 9th) a group of 50 or so people headed out past Rattle Snake Island to the far corner of the western basin of Lake Erie aboard the Coast Guard vessel “Mobile Bay” to the Battle of Lake Erie site to set a permanent mark. At around 11:30 while stationed on the battle site, we witnessed Bicentennial Chairman Dave Zavagno, who was given the privilege by Captain Stone of the USCG vessel “Mobil Bay” to order the buoy release, the beautiful “Battle of Lake Erie Bicentennial buoy” set in place. The buoy is now located at the precise coordinates of 41-44-50.00 N by 083-02-00.00 W.
Now Perry’s monument view is connected exactly to the place and time where so many men died for a fledgling country, and where Perry accepted British Commander Barclays’ surrender. And not far from where Perry scribbled the words “we have met the enemy, and they are ours…” A sacred place is now properly marked for the 200th Anniversary. The Buoy ceremony had capped off a week of activities to denote the advent of the celebration to come in the year ahead that kicked off on Thursday August 30th when over 250 people boarded the Jet-Express 2 in Put-in-Bay and headed to Cleveland’s Navy Week. This year’s Navy Week in Cleveland was especially important since US Navy had designated Cleveland as one of 15 port cities that are part of its’ official observance of the War of 1812. So on that balmy day in Cleveland, Blue Angles streaking by overheard and the Brig Niagara on hand after a day of sailing, the Friends of Perry’s Victory and International Peace Memorial coordinated a special observance that included a moving “Transfer of Command” from the Brig Niagara to the USS DeWert. Oliver Hazard Perry Cabot, a direct descendant of Commodore Perry was rowed from the Niagara to the docked USS DeWert just across the Port of Cleveland Channel. He presented his “Don’t give up the ship flag” to Rear Admiral Greg Nosal. This connection of the past to the present was a poignant symbol of a amazing progression from Perry’s first ever-fleet victory for the fledgling Us Navy to the modern Navy’s current peacekeeping mission. Despite the difference of vessels and costume, Perry’s motto (DGUTS) still resonates just as strongly today as it did 199 years ago. Historic weekend’s festive parade, the NPS ceremonies featuring Rear Admiral Joseph Horn Jr., the Toledo Symphony and the evenings quietly moving “Lights of Peace” Harbor Illumination capped off a wonderful 199th anniversary. As we count the days until the 200th anniversary we are thankful for the sacrifices made on our behalf and savor the continued sacred peace we all enjoy here in Ohio. 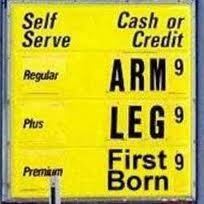 Get ready, because they say that gas prices may hit new record highs this summer. So as you sift through your vacation ideas I want to suggest how one tank of gas, American history, men (and women) in costumes and warm summer breezes might fit in. This year begins a multi-year observance of the War of 1812. The bell rings, literally, on June 18th as the Re-Declaration of War is read out loud at 1812 Communities across the country. For people here in Northwestern Ohio, there are dozens of great events, costumed re-enactments and historic sites to visit this summer starting with Fort Meigs (Dayton), Battle of Frenchtown (The River Raison Michigan), Fort Malden (Amherstburg Ontario) and especially Perry’s Victory and International Peace Memorial, Put-in-Bay the staging site for Commodore Perry’s fleet in the Battle of Lake Erie. When I was a kid we lived in Columbus (founded by the way in 1812!). Many summers my mother and I would drive to various family events and on our way we would always detour to include a historic site. We toured battle sites of the Civil War from Antietam to Gettysburg, We visited pre-revolutionary war sites like The Cumberland Gap (Fort Patrick Henry), Boonesborough ( Daniel Boone home) and Fort Necessity (French and Indian War). On one especially memorable trip we saw Perry’s Monument, the Flagship Niagara (in Erie Pennsylvania), and Fort McHenry in Baltimore where on a momentous night in 1814 Francis Scott Key wrote the Star Spangled Banner! As a child these excursions made history come alive for me. Seeing first hand the important sites mentioned in history class was an awakening, and cemented my understanding of the connections between our past and the present. For the next couple of years American history comes alive in our own back yard. With so many important sites integral with the War of 1812 this close by, no need to spend big bucks to travel. So where to go? 200 years ago California was a sparsely settled land with a sprinkling of Spanish missionaries and Russian fur trappers. The Gulf Coast and Carribean were controlled by French and Spanish Ships of War, and in Colorado Zebulon Pike had just accidentally “discovered” Pikes Peak. But here in the Midwest, where the real expansion westward was causing endless battles for land control between the French, British and the Shawnee Nation, you can visit dozens of sites and see first hand the real effects of war and now peace. So forget about California, Florida or Colorado (all nice places to visit) it’s all right here in Ohio, Indiana, Michigan, (and Ontario). During the next three years not only will the American and Canadian governments be actively involved in the retelling of this struggle but many of the First Nation will also participate sharing their point of view as well. (As an aside-The great Chief Tecumseh, who died in the War of 1812, made his home in the Ohio region. He is the subject of a spectacular outdoor drama in Chillicothe Ohio called “Tecumseh”. ) We’re all just a short drive from Lake Erie where the September 2013 Battle of Lake Erie Celebration will take place and a bevy of activities scheduled for this summer that will extend along both sides of the border from Amherstburg to Buffalo, Dayton to Put-in-Bay. So fill up the tank and take a trip to any one of these great destinations. I am particularly partial to having you come visit Put-in-Bay this summer. Perry’s Victory and International Peace Memorial will be host to a series of special events from May’s Seeds of Peace to the planned reopening of the Observation deck at the monument in June. Then Francis Scott Key will make an appearance here for the July 1st Symphony concert at the Monument and at the end of the summer you will really want to be here September 8th and 9th for Historic Weekend. This year at Historic Weekend we begin celebrating 200 years of peace with Canada and Great Britain. On Saturday September 8th join costumed re-enactors, the US Coast Guard, and the Toledo Symphony for a moving musical celebration of peace. This will be followed by a twilight Harbor Illumination. A moving remembrance of family, loved ones and our military as the sun sets over the bay. Then next summer get ready for the Tall Ships to return to Lake Erie and Put-in-Bay as we celebrate the 200th anniversary of the Battle of Lake Erie. 12 days of events from August 30th –September 10th. This is where America became a country. Fill up the tank and drive. If you love history like I do (or just want to see something different) Lake Erie is the place to be this summer.